Once in a while, I’ll read complaints on a Facebook group or something of the like of wedding flowers not lasting throughout a wedding day. So, here are some tips on how to take the BEST care of your wedding flowers! Before I get too far into this, it really comes down to using common sense: remember that flowers are live things, and treat them as such. If you throw your bouquet around, the delicate petals will be damaged. If you leave it out of water on a hot day, it will wilt. If you leave it in an unheated car when it’s below zero, it will freeze. Think of flowers like skin, except those petals are even more delicate and they don’t have the ability to regenerate themselves! After delivery or pick up of flowers, it is the client’s responsibility to keep flowers hydrated throughout the day to maintain freshness. Place bouquets into their water sources throughout the day to allow for hydration (I always deliver my bouquets in vases to give them the best chance). In hot weather, flowers should be kept out of direct sunlight as much as possible, which will cause them to wilt. Some flower varieties are more prone to wilting than others, and if you’re getting married in the heat of summer, there’s just honestly very little that we can do to protect those fragile blooms. Generally, keeping them in water and out of heat will be your best bet! In cold temperatures, flowers should not be exposed to air below or around freezing. Flowers will be delivered with a plastic covering; keep this closed over the flowers any time they are outside. Do not leave flowers in an unheated vehicle. Flowers will freeze and brown when exposed to freezing air - and note that this includes air conditioners! Last year I had a photographer friend text me a photo of a bouquet (not one of mine) to ask what happened to it, so she could try to help the bride. The white flowers had completely browned and gone mushy. I asked where it was placed - the photographer told me that the couple had picked up the flowers from their florist the night previous to the wedding, and they had left them right in front of the air conditioner. As much as we do want to keep the flowers cool, the air coming out of an air conditioner is often too cold when it’s directly on the flowers, and that poor bouquet froze. Once a flower is frozen, there is no going back! One bummer about temperature is that we can rarely control it. This includes your venue! The first week that the heat goes on in the fall often ends up with the venue being SUPER hot. I hate to say it, but there’s just nothing I can do to combat the inevitable wilt of some of your flowers under that blowing heat. A few years ago, I had a winter wedding where the ballroom must have been at least 26 degrees Celcius - in other words, it was smoking hot. I think their plan was to warm up the room quickly so that they could turn down the heat once guests arrived, but of course that plays a major impact on the flowers. I was running around the room making sure that every stem was in water and replacing some stems that had already started wilting, but there was nothing beyond that that I could do. Tent weddings often have a similar situation - I would recommend that if you’re having a tent wedding, ask your venue coordinator or wedding coordinator to open up the side panels to allow for as much air flow as possible. There’s nothing like a dank heat settling in a tent to create that oppressive greenhouse effect that cut flowers do not often thrive in. One of the weirdest wedding mornings I’ve ever had was when the bride’s father came to pick up her bridal party flowers…with a full car. And it wasn’t just that there were dress bags or something in the backseat - it was full of PEOPLE. Like, there was literally no room in the car for the flowers. I asked him what his plan was, and he promptly popped the trunk. PEOPLE. Trunks are not air-conditioned, nor are they safe for something fragile to be bouncing around in. Please, please, please do not put your flowers in your trunk if you care about them at all! I told him there was no way he could do this and I suggested the people in the backseat hold the flowers on their laps (luckily, it was a very small order of just bridal party bouquets). Now I know that on a wedding day, you’re rarely staying in one place all day long. You’re probably hopping into a limo to go off-site for photos at some point, and that’s perfectly fine! I deliver my bouquets in long cardboard boxes that are quite sturdy, and then packed really well with tons of paper in between the vases. The easiest thing you can do it just pop the bouquets back into their vases, have one person pick up each end of the box, and slide it into the vehicle. No trunks :) Do not leave flowers in a closed, un-air-conditioned vehicle. That’s a weird way of wording it, but if you’re facing a really hot day or you’re just worried about the longevity of the flowers, don’t have me deliver your bouquets at 8 am. If all of your pictures are taking place between the ceremony and reception, I can deliver your bouquets to you shortly before you leave for the ceremony location, which means that they’ll be able to stay in my cooler for longer! Most photographers don’t care to have the flowers in every photo, anyways, so you won’t need them all day long. Similarly, opt to have the flowers picked up or delivered on the day of the wedding as much as possible, and not the day before. Rarely does this happen in my business, and usually only when the wedding is out of town so I understand that sometimes we need to make an exception and have the flowers picked up the day before. But generally, I do my very best to avoid this! Again, the longer they can stay in my cooler, the better for the flowers. What is in “harm’s way,” you might ask? Pets, curious little kids, overbearing mothers or wedding coordinators... Some pets will have a tendency to sniff a little too closely or even try to take a bite out of a bouquet. Little kids might tear through the getting ready space and knock a bouquet down, or get their hands right into the flowers and rip apart those fragile petals (though I will say, the ring bearer at one of my weddings this year tried to eat a flower out of his mom’s bouquet while she carried him down the aisle, and it was adorable). The occasional mom or wedding coordinator will think they know best and attempt to “perfect” the piece that’s already been perfected by your designer. At the shop I used to work at, we once had a wedding coordinator (truth be told, she was NOT a professional wedding coordinator, but someone the family knew who was a little overly bossy and wanted to be involved) who called us to re-make a bouquet 3 times on the morning of the wedding. Why? Because she thought that the petals weren’t perfect enough, and picked off all of the “damaged” petals - aka she made the bouquet bald, twice, before learning her lesson. Luckily, a retail shop often has enough leftovers to re-make a bouquet and we made it work for that bride but we had to tell the coordinator HANDS OFF! The most important thing to me is that your flowers look beautiful on the day of the wedding. My job is to make sure each bloom is at it’s very peak on the day of, and in most flower varieties, they look their absolute best shortly before they die. Of course I would LOVE for your flowers to last a week after your wedding, and very often they do - but the after isn’t what matters the most. All photos in this post by Charmaine Mallari Photography. Last December, I wrote a 3 part blog series about wedding flower budgets (links to those three posts are at the bottom of this one!) and it was incredibly popular, with both florists and wedding couples alike. I was thinking about that the other day, and with us entering planning season, I thought this would be the perfect time to dust it off - but I wanted to add a little more. I'll be the first to admit that Stone House Creative is not a "budget" florist. I run a profitable business and I'm both proud and happy about that - I think all businesses deserve to be run profitably. If a business isn't profitable, it has no business being a business! But regardless of how much I charge for wedding flowers, something I hate seeing is when couples are over-promised and under-delivered. So, here are some of my top tips for getting the most of your wedding flower budget. 1) First, HAVE a wedding flower budget! To start, you must understand that flowers are a luxury item. They are a perishable item, just like the food that you're serving to your guests, often having been flown from halfway around the world and perfectly timed in order to make it here in pristine condition (it's amazing how frequently people don't think about this fact of nature). With that comes a price tag. But simply walking into a florist shop and saying "I don't know how much wedding flowers cost" isn't always helpful - often because that comes along with an enormous gasp that makes a florist feel as though she's done something to personally insult you. Come prepared with a number that you are both comfortable spending on this luxury item, and one that makes sense for what you're asking for. Most likely, you'll have no idea what wedding flowers cost SO here you'll find a very helpful BUDGET BREAKDOWN of different price ranges associated with pictures to help you get a visual for the size of arrangements that you're interested in. There is absolutely no shame in not having a clue what things cost, and there aren't a lot of helpful resources out there that actually show you want flowers cost, particularly in Manitoba. That link will do so! 2) Discuss with your florist what your primary concerns are. Is the overall budget your biggest thought? If so, then we (the florists) will make very specific suggestions for lower cost, readily available flower types for you in the colour palette that you want. 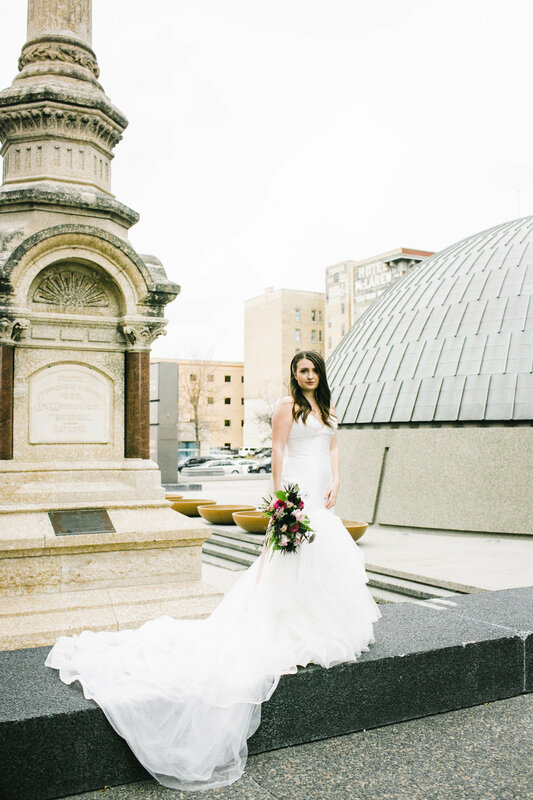 Maybe your primary focus is your bridal bouquet, and everything else is just background. That's awesome - we'll use the premium flowers in your bouquet, and scale back on the rest of the arrangements. Maybe you couldn't care less what your bouquets look like but you REALLY want flowers on every guest table. Cool! Again, we'll make specific suggestions for the best way we can accomplish this! I might suggest going with a single-ingredient bouquet to keep the bouquet costs at a minimum and then have more fun with different varieties and textures in the reception flowers. The point is, tell us what your top priorities are and then see what we can come up with. It's a large part of our job to be able to create awesome designs that fit your wish list, and we LOVE whenever we get the chance to actually do this! 3) Plan in advance how your arrangements can be re-purposed, and don't forget to let your florist in on this conversation. I'm a big believer that anything you use at the ceremony should be something that can be re-purposed at the reception. Whether it's two large arrangements set on pedestals at your altar being moved to either side of your head table, or those gorgeous arrangements on your arch being re-purposed into your head table decor or as a backdrop for your cake table, it's great when you can get double-duty out of your ceremony flowers. This is why I'll almost never recommend that a couple opt for aisle bouquets: they're tricky to re-purpose and you'll get a bigger bang for your buck if you keep the focus up on the front. 16 small arrangements on the pews can cost just as much as 2 statement making pieces at the front! But, please don't make this plan without your florist's input. The reason for this is because we might need to build an arrangement in one way for your ceremony, but if we had known that it would be re-purposed on your sweetheart table, then we would have built it in a different way. It's our job to think about the mechanics behind the flowers, and it's also our expertise - so let us help and make it go as smoothly as possible! 4) Skip the boutonnieres and corsages altogether. This isn't always a popular opinion, but if you're on a tight flower budget, just don't order any boutonnieres or corsages. It's a similar argument to the aisle bouquets at your ceremony: they may be relatively inexpensive little things on their own, but anything multiplied by 3 moms and 2 grandmas, 6 groomsmen and 2 dads plus the ushers, emcee, special aunties, sponsors, etc. is going to add up really quickly! In fact, I'd go so far as to say that this is the biggest waste of money that is a part of wedding flower budgets and is often a trap that lower budget couples get stuck in. And think about it: if you're spending serious coin on a beautiful groom's suit, why would you want to stick pin-holes in it? Why would your mother want to shove a silly flower on her wrist when she's spent hours trying to find the perfect mother of the bride gown, when a piece of jewellery would look so much better? And truthfully, no matter how cute we florists make these little pieces, they're still fussy / uncomfortable / irritating / challenging to put on and make sure they stay put. 5) Don't just go for the lowest quote that you receive. Several years ago, I quoted a couple on the wedding of their dreams. We were slightly over their budget, but we had EVERYTHING included that they could have wanted, all of the little "extras" that they were hoping for. They were so happy with the quote, and I was astonished a few days later to find out that they decided to go with another shop. This shop wasn't known for doing weddings at all, let alone doing a nice job of weddings. They also weren't charging tax, which is a major red flag in my opinion (if a business isn't charging you tax, it means that they're not running their business legally. Is that really who you want to be dealing with? What other areas of their business are they running in a shady way?). That being said, I wasn't surprised to get a call 5 weeks before their wedding begging us to take their wedding again. Why? They had realized that the quote from this other shop, which was marginally less than what we had quoted, was not at ALL comparable to what we were proposing to them. A mock up of a $100 centrepiece that was a measly single white hydrangea and feather in a tall glass made them quickly realize that they hadn't done their proper research, and they'd just looked at the lower price tag. This is the perfect example of over-promising and under-delivering, which is totally unacceptable (and yes, we took their wedding on and did an awesome job of it - and there are lots of great, reputable shops in Winnipeg who would do their absolute best to help you if this is the situation you find yourself in). 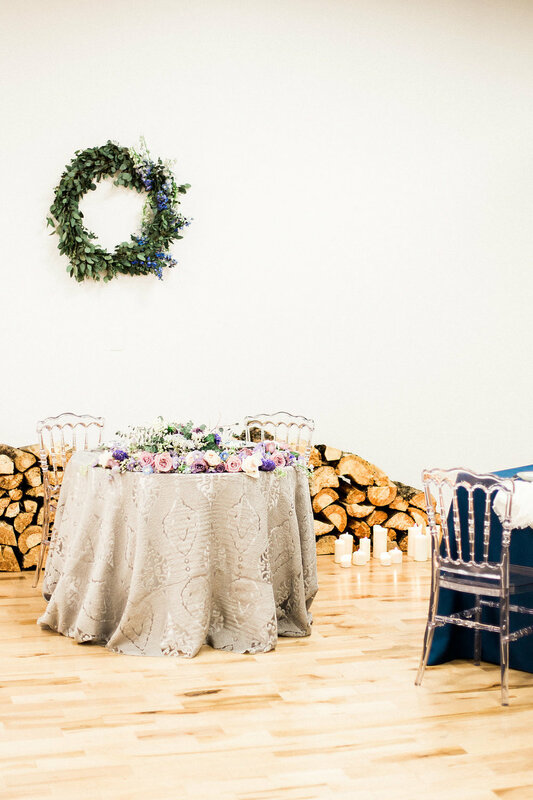 When you're comparing different florists, it's much more important that you chose someone who you feel really understands the vision you have for your wedding, and will complement it with great floral designs. Choose the company who got you excited about the flower planning and whose work you love. That florist will be able to make the best suggestions to you on how to get the most of your wedding flower budget. This probably should have been tip 1, because it's really the most important of them all. If you're concerned about your flower budget, whether it's $500 or $5000, the best thing that you can do to help yourself is to be flexible. Presenting a list of demands to your florist and requiring that he or she fits it into your budget will rarely work in your favour. Instead, I'd suggest that you tell your florist what you're drawn to and what you'd ideally love to see as a general style overview, and then allow her to create an overall plan for you. You might not see flowers filling every table, but you could end up with some of the tables having lush, gorgeous arrangements that make an enormous spotlight with scaled back designs on the other tables - and still within your budget. This wedding is the perfect example of "be flexib le." The bride, who lived out of town and wanted to minimize her planning stress, told me what her overall vision was, gave me a good idea of her style, and was clear on what budget she was comfortable spending. She knew exactly what she was comfortable spending (and it was a realistic number) but didn’t nitpick the details, which allowed me to make the best decisions for her budget. she let me come up with the entire design plan and we ended up with such a good setup!